Irish beanie displays the embroidered Guinness shamrock logo on both side. What better way to combat the weather that with this stylish and comfortable Guinness beanie. This quality one size fits most Guinness ski cap is reversible, allowing you to enjoy a Kelly green style one day the classic black with a green border the next. This Guinness beanie features a reversible design that features both a Kelly green and a classic black with green trim option. 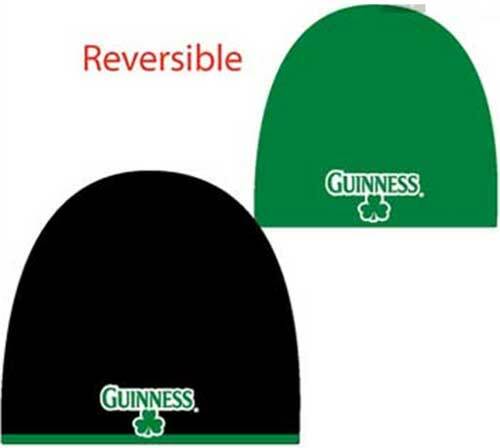 The Guinness ski cap is one size fits most and is made of 55% cotton and 45% acrylic. The Irish beanie is received with a shamrock history card, complements of The Irish Gift House. Guinness beanie is an embrodered cap that sports a visor along with the harp logo.